The HDM Adjustable Lead Cassette is designed to provide fine adjustment to the rear axle lead. This cassette is machined to fit standard 1 1/4" Rear Bearings. Both the front plate and back plate are CNC machined from 6061T6 Aluminum. The lead cassette is supplied with four lock down bolts and one adjustment bolt with jam nut. 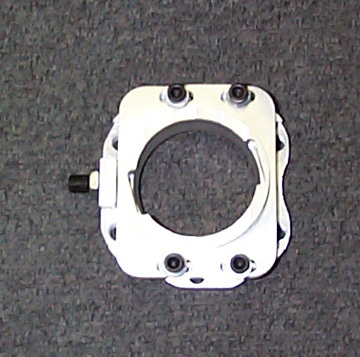 Depending upon the chassis this will be mounted to, the user may be required to drill a hole in the side of the bearing hanger so that access can easily be gained to the adjustment screw. HDM offers two versions of the lead cassette. The Standard version fits the Banshee and most other chassis on the market. The Wide Pattern version is designed to fit the Nemesis. These cassettes will NOT accept the Sealmaster bearings. Bearing is not included.